NEW YORK (AP) — The second major storm in less than a week moved up the East Coast early Thursday, dumping heavy snow and knocking out power to hundreds of thousands of homes and businesses from Pennsylvania to New England. Some places saw more than 2 feet of snow by late Wednesday. Montville, New Jersey, got more than 26 inches from the nor’easter. 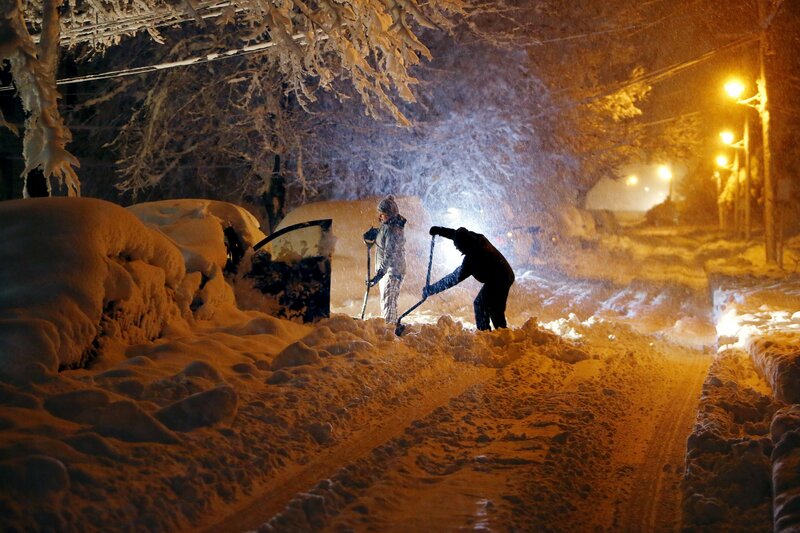 North Adams, Massachusetts, registered 24 inches and Sloatsburg, New York, got 26 inches. It was not much better on the ground. Members of the Northeastern University women’s basketball team pushed their bus back on course after it was stuck in the snow outside a practice facility in Philadelphia. The Huskies were in the city to compete in the 2018 CAA Women’s Basketball Tournament. The team posted a video of the feat on its Twitter account. Amtrak suspended service between New York City and Boston until at least 10 a.m. Thursday. New York City’s Metro-North commuter railroad suspended service on lines connecting the city to its northern suburbs and Connecticut because of downed trees. It was not immediately known when service would be restored. The storm was not predicted to be as severe as the nor’easter that toppled trees, inundated coastal communities and caused more than 2 million power outages from Virginia to Maine last Friday. In New Jersey, the state’s major utilities reported more than 300,000 customers without power by late Wednesday, with some left over from last week. Utilities across the Northeast also reported tens of thousands of homes and businesses without electricity. The National Weather Service issued a winter storm warning through Thursday for most of New England as the storm continued to make its way through. In Worcester, Massachusetts, public works crews late Wednesday had a hard time keeping up with the snow.